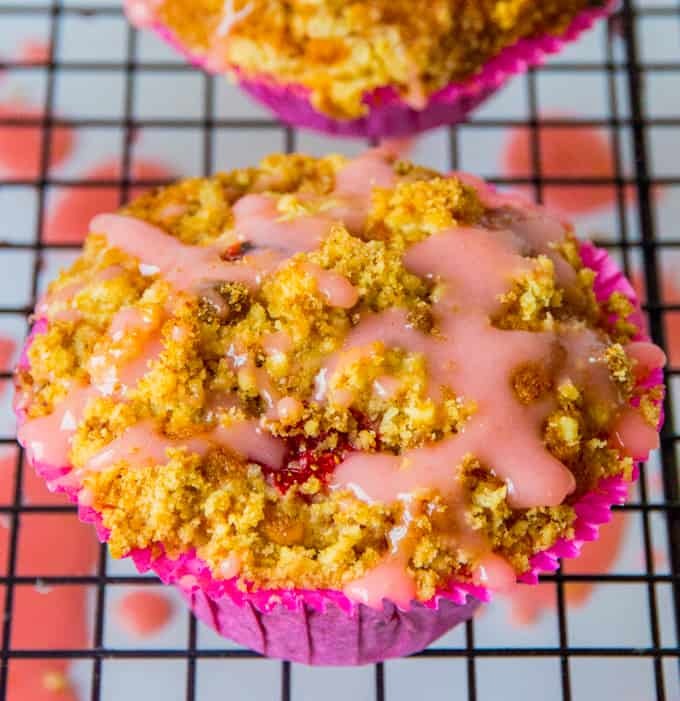 Strawberry Streusel cupcakes – Light, fluffy sponge with chunks of juicy strawberry, stopped with crunchy streusel and a sweet strawberry drizzle. Sometimes things don’t work out for a reason. At the time it’s disappointing and frustrating – especially when you’ve put time and effort it. You don’t want to see that effort go to waste, so you make some changes and try again. and then again. With a little luck, you may find you end up with something better than you’d hoped for originally, and you’ll have learnt a good few things on the way. As a food blogger it is disappointing when recipes or pictures that you’re taking don’t work out. 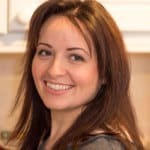 Just yesterday, I had a busy day and tried to do three recipes and three photoshoots. Two of the recipes tasted great, but my photos were awful (I’m still learning, and Chris is away with work so I can’t get him to photograph for me) and the other recipe photographed great but tasted awful. I grumpily gave up thinking I’d wasted a day, but then later on I realised that I’d actually learned quite a lot. I know what went wrong with the photos (composition issues and bad lighting) and I know what went wrong with the recipe. I can reshoot the photos. The recipe? well no amount of adjusting is going to fix it, but I may save it for an end-of-year roundup of kitchen fails. So not a total waste!! It’s the same with these cupcakes. They started out life as a lemon drizzle cake (I know, it’s like the six degrees to Kevin Bacon thing. Except, err it’s only 2 degrees, and Kevin has no involvement). I decided it’d be great to make a strawberry drizzle cake. A bit of experimentation and a lovely, moist cake recipe was developed. However, i’m pretty confidant that it’s impossible to make a crunchy, sugar drizzle out of strawberry juice. Works great with lemon juice. Try it with strawberry juice and you basically end up with jam. A lovely cake with a smearing of sticky jam. Not very attractive. So here’s what I came up with. I wanted the soft, fluffy cake. I wanted a topping with a bit of crunch, and I really wanted a strawberry infused drizzle. 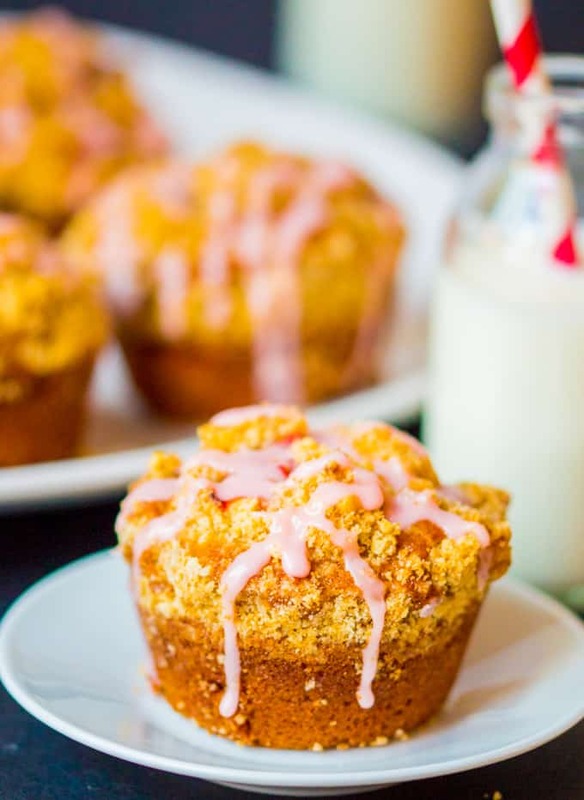 These muffins tick every box!! They’re actually really simple to make and I have a couple of magic ingredients that take these cupcakes to a new level. Vegetable (or coconut) oil in place of butter – this ensures a more moist cake. Using butter usually adds more taste to a cake, but the other big flavours in these cupcakes ensure you’re not missing out on flavour at all. Strawberry yoghurt. I use this to a) add more strawberry flavour, b) to make the cupcakes even more moist and tender and c) to act as an acid which will react with baking soda (an alkaline) to produce a lovely rise. This acid/alkaline combination means you don’t need to use other rising agents like baking powder. 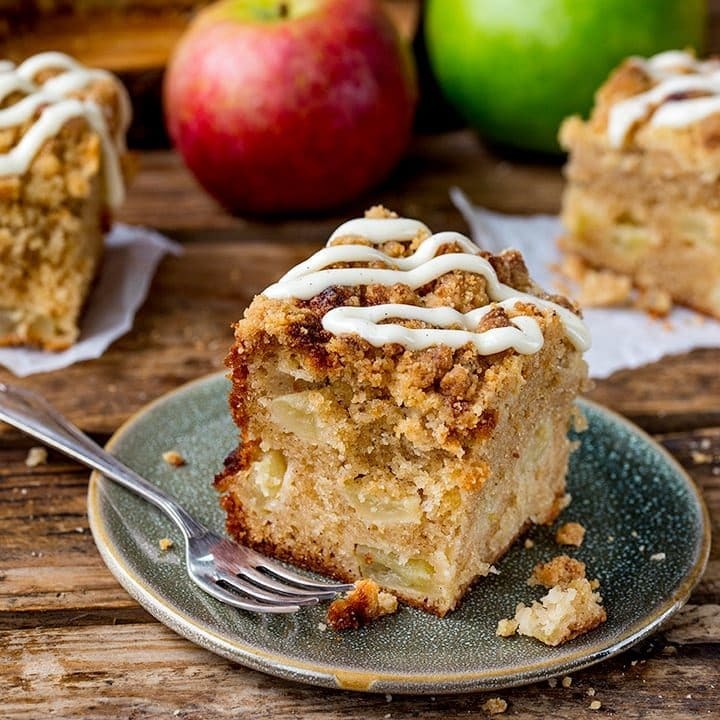 First, you’re going to make your streusel topping. This is a simple case of rubbing small chunks of cold butter into flour until you get breadcrumbs, and then mixing in some light brown sugar. Next you’ll combine your main cupcake ingredients by mixing together egg, sugar, oil, vanilla and yoghurt (no electric mixer needed). Stir in the flour and baking soda and finally you’ll carefully fold in a big pile of chopped strawberries. 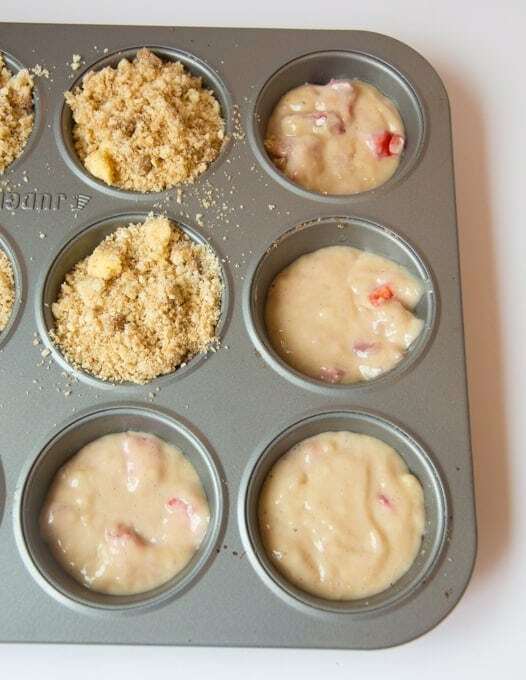 Spoon the cake mixture directly into your muffin tray. Fill about two thirds full, and then add a good spoonful of the streusel mixture before placing in the oven. 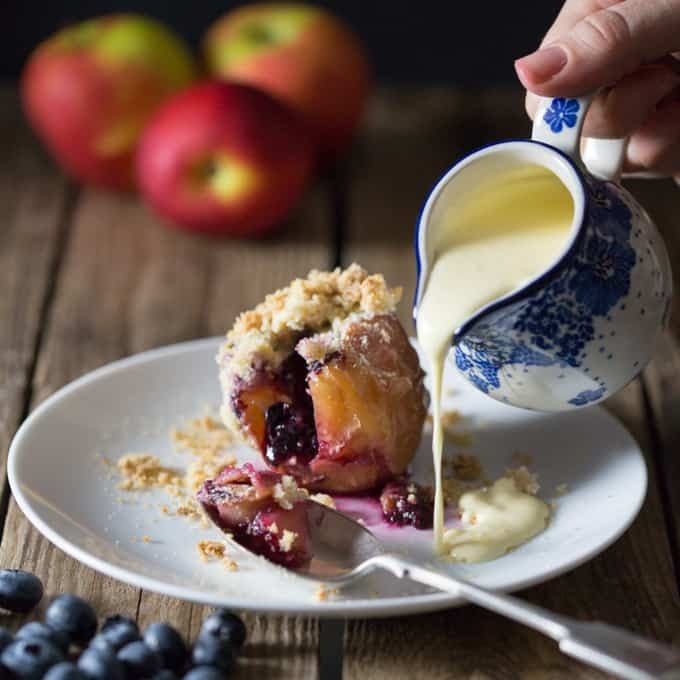 Push this juicy mixture through a sieve and then mix with icing (powdered) sugar until you have a lovely, pink thick drizzle. 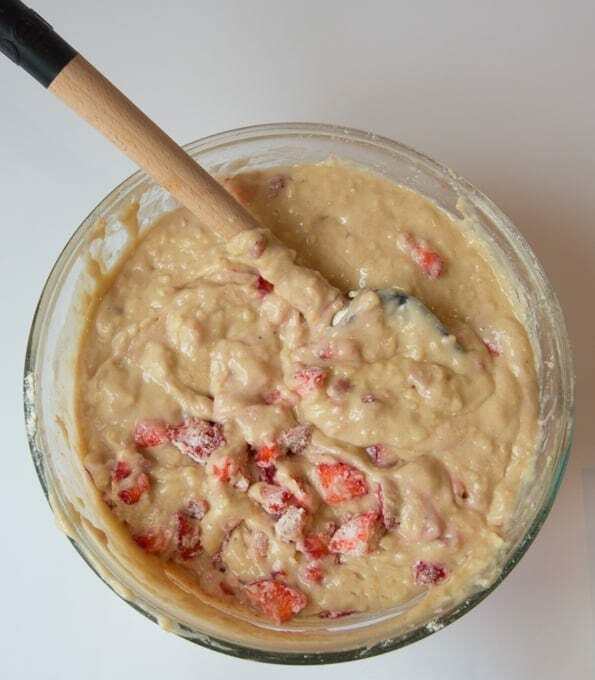 Leave to thicken for 10 minutes or so whilst your cupcakes are cooling, then drizzle this mixture over the cupcakes using a spoon. Make your streusel by placing the flour and butter in a bowl and rubbing it together to form breadcrumbs. They don't have to be too fine, some larger lumps are good. Once you have breadcrumbs, mix in the sugar and leave to one side. Next make your cupcakes. Add the sugar and egg to a large bowl and mix using a fork or balloon whisk. Add in the oil and vanilla extract, stir, and then add in the yogurt and stir to combine. Next add in the flour and baking soda and mix together using a wooden spoon. 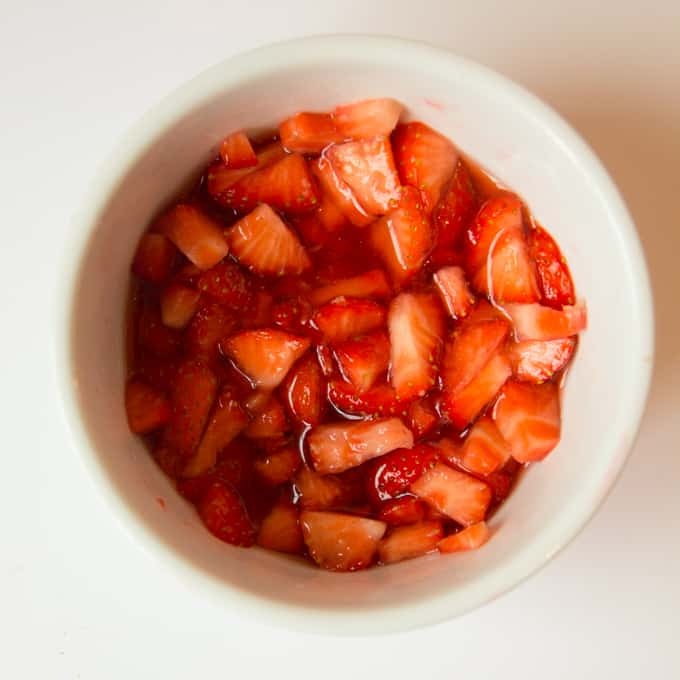 Gently fold in the chopped strawberries that have already been mixed with 1 tbsp. flour. Take a 12 hole muffin tin and fill each hole two thirds full (you don't need cupcake cases) with the cake mixture. You may find you just about have enough for one extra cupcake if you have another tin!. Add a heaped tbsp. 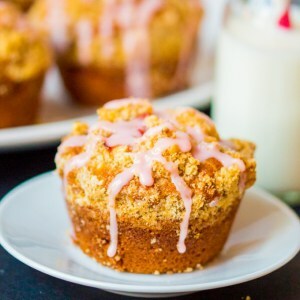 of the streusel topping on top of each cupcake. Place in the oven and cook at 200c/400f for 5 minutes, then turn the oven down to 180c/350f and cook for a further 15 minutes. Once cooked, leave to cool in the tin for 10 minutes before removing and cooling further on a cooling rack. 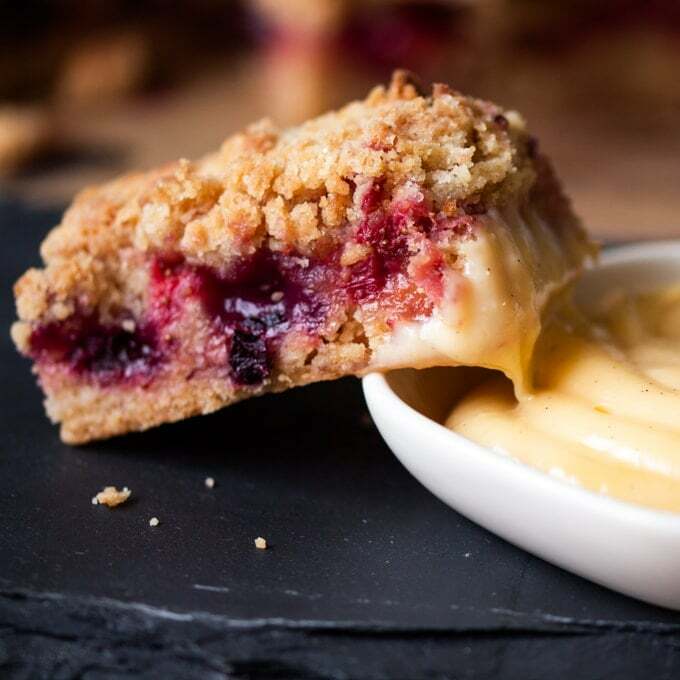 Whilst the cupcakes are in the oven, make your drizzle. 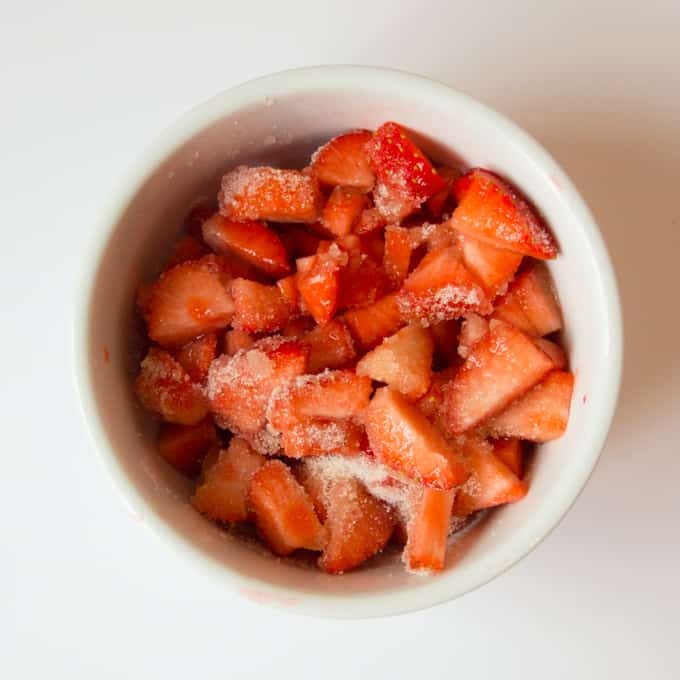 Place your chopped strawberries in a bowl and add the caster sugar. Give a gentle mix and then leave to macerate for 15-20 minutes. Once the juices have been released, push this juicy mixture through a sieve and add the icing (powdered) sugar to the liquid. Whisk together until all lumps have disappeared. You should have a drizzle that is of thick pouring consistency. Leave to thicken a little more for a few minutes, and then drizzle over your cooled cupcakes. These cupcakes will keep for 2 days in a sealed container at room temperature. Nutritional Information is per serving, based on 12 cupcakes. Great fun making these with my grandchilden, and an even better time eating them. Yummy. These cupcakes look so good-love that streusal topping! Thanks Nancy. 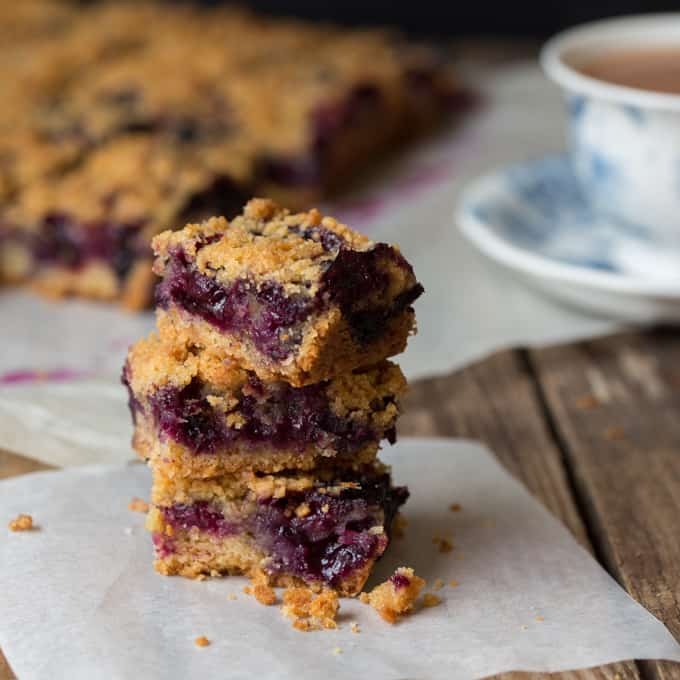 Me too, definitely becoming a streusel addict! you’re spot on Lily, got to take it all as learning. Thanks for checking out the cupcakes. I think my next cupcake batch will be your chocolate chip ones, they look amazing!! These are so cute! I just bought my first muffin tin – I might have to break it in with this recipe!! !